The Minister for Energy and Clean Growth, Claire Perry, will today (31 January 2019) launch an initiative to create a network of new and extended city climate commissions in Edinburgh, Belfast and Leeds. The project aims to help the UK meet the requirements of the 2015 Paris Agreement on climate change and the UK Climate Change Act by building local capacities and stimulating the flow of green finance into cities across the UK. The Place-based Climate Action Network (P-CAN) will help the local delivery of the UK’s climate change objectives by supporting action in UK cities through a partnership made up of the private, public and third sectors. P-CAN will be announced today at a national green finance conference on ‘Investing in Local Energy’ in Leeds. Claire Perry MP, Minister of State for Energy and Clean Growth, will deliver the keynote address at the conference, which is being organised by UK100 and Leeds Climate Commission, together with the Department for Business, Energy and Industrial Strategy. The Minister is expected to say: “I would like to announce the establishment of the Place-based Climate Action Network (P-CAN). This is a new £3.5m research network that has been set up to enable cities and towns to build much needed local action on climate change, by building their capacities for action, developing investable projects and accessing finance. The Economic and Social Research Council (ESRC) is investing £3.5 million in P-CAN over the course of five years. It will be hosted by the London School of Economics and Political Science, the University of Leeds, the University of Edinburgh and Queen’s University Belfast. It will seek to increase engagement between university researchers and the public, private and third sectors in tackling climate change. P-CAN will help to accelerate and sustain the transition to a low-carbon, climate-resilient society through the creation of local climate commissions, following the Leeds model developed in 2017, as well as other broader measures focused on increasing investment in low-carbon, climate-resilient development. There is a pressing need for cities and towns across the UK to take action on climate change, and a major opportunity for them to do so in ways that also help them deliver on their economic and social ambitions. But to take these opportunities cities and towns need to build their capacities for action, and they need to find new ways of developing investable projects and programmes and accessing investment. P-CAN will do exactly these things. Another key dimension for P-CAN will be to explore how to ensure that any low-carbon energy transition is a ‘just transition’ so that nobody and nowhere is left behind in the transition to a low-carbon, climate-resilient economy. Professor Sam Fankhauser, Director of the Grantham Research Institute on Climate Change and the Environment and Co-Director of the ESRC Centre for Climate Change Economics and Policy (CCCEP) at the London School of Economics and Political Science, will be the principal Investigator for the project. He said: “The aim of the new network is to inform and promote climate change action at the local level. I look forward to working with researchers, businesses, local communities and policy-makers to meet the UK’s climate change objectives”. The P-CAN project will take forward and extend a model of partnership working with the public, private and third sectors which has been developed in Leeds by Professor Andy Gouldson. Professor Gouldson, Deputy Director of CCCEP and a speaker at the Leeds conference, has conducted extensive research on the economics of low-carbon cities, and has demonstrated huge opportunities for cutting energy bills and reducing emissions in cities. P-CAN will also operate a Flexible Fund that will commission between 20 and 30 small grants for the wider community of climate and energy researchers practitioners to explore innovative approaches. P-CAN will seek to influence decisions on climate change and the low-carbon energy transition at a local and national level while feeding into policies such as the Government’s Industrial Strategy and UK Clean Growth Strategy. Jeremy Neathey, Deputy Director for Research and International at ESRC said: “This is a really exciting project, bringing together interdisciplinary research and members of industry, to tackle an issue of the utmost importance”. For more information about this media release, please contact Bob Ward (LSE) on +44 (0) 7811 320346 or r.e.ward@lse.ac.uk, Kate Lock (University of Leeds) on +44 (0) 7792 633984 or k.m.lock@leeds.ac.uk, Zara McBrearty (Queen’s University Belfast) on (0) 28 9097 3259 or z.mcbrearty@qub.ac.uk, or Helen Dunk (University of Edinburgh) on +44 (0) 7804 652960 or helen.dunk@ed.ac.uk. The Economic and Social Research Council (ESRC) is part of UK Research and Innovation, a non-departmental public body funded by a grant-in-aid from the UK government. For more information visit www.ukri.org. ESRC is the UK’s largest funder of research on the social and economic questions facing us today. It supports the development and training of the UK’s future social scientists and also funds major studies that provide the infrastructure for research. ESRC-funded research informs policymakers and practitioners and helps make businesses, voluntary bodies and other organisations more effective. UK Research and Innovation is a new body which works in partnership with universities, research organisations, businesses, charities, and government to create the best possible environment for research and innovation to flourish. UKRI aims to maximise the contribution of each of our component parts, working individually and collectively. It works with its many partners to benefit everyone through knowledge, talent and ideas. Operating across the whole of the UK with a combined budget of more than £6 billion, UKRI brings together the seven Research Councils, Innovate UK and a new organisation, Research England. Leeds Climate Commission was launched on 7 September 2017 by former Environment Secretary and Chair of the UK Committee on Climate Change, Lord Deben. 24 key businesses and organisations are represented on the Commission, which is a public-private-civic initiative that aims to promote climate action across Leeds by fostering collaboration on projects that result in measurable contributions to the city’s emissions reduction targets. 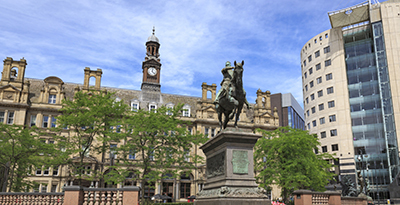 The Leeds Climate Commission is chaired by Professor Andy Gouldson, with Leeds City Council in the role of deputy chair (Councillor James Lewis, Executive Member for Resources and Sustainability). Leeds Climate Commission seeks to be an independent voice in the city, providing authoritative advice on steps towards a low-carbon, climate-resilient future to inform policies and shape the actions of local stakeholders and decision-makers. Get the latest commentary, upcoming events, publications and research.